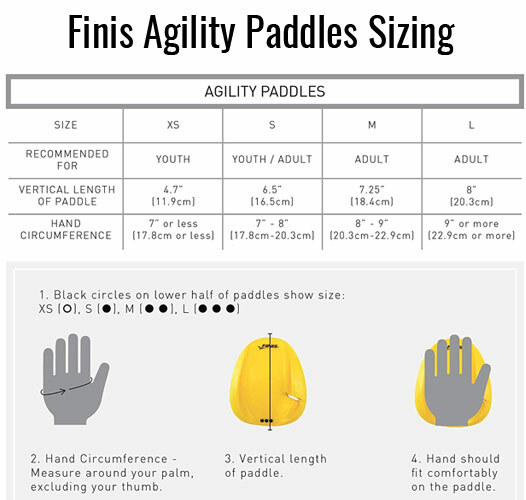 The FINIS Agility Floating Paddles are a strapless paddle designed to provide instant stroke feedback for technique imperfections. The design of the paddles promotes an early catch and vertical forearm position. A strapless design creates an instant feedback response when incorrect technique is used as this will cause the paddle to fall off. Additionally, the absence of straps also makes for a simplified fit, eliminating the hassle of broken or uncomfortable straps. The ergonomically-advanced design of the Agility Floating Paddles requires a proper palm positive hand position. The paddles are a versatile tool for all four swim strokes and accommodate every swimmer.